IP Result of anti-HDAC1 (IP:10197-1-AP, 3ug; Detection:10197-1-AP 1:500) with mouse testis tissue lysate 10000ug. 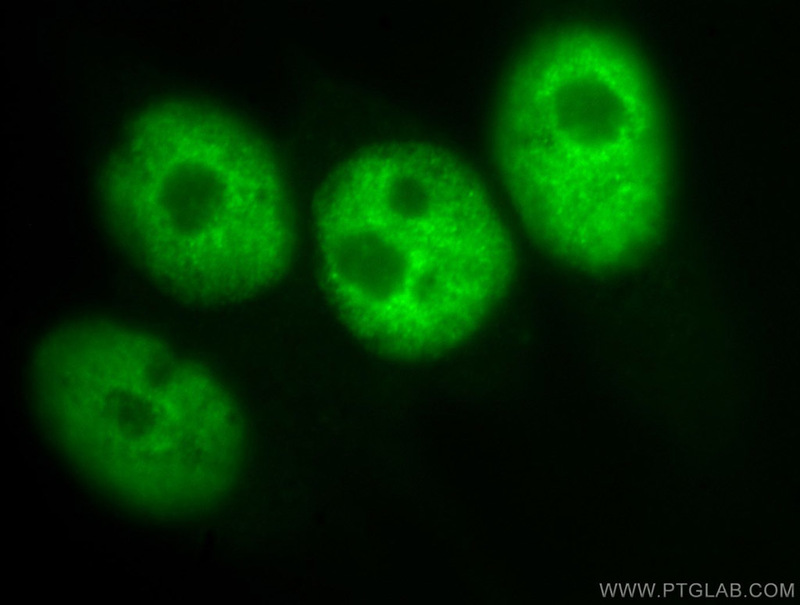 Immunofluorescent analysis of SH-SY5Y cells, using HDAC1 antibody 10197-1-AP at 1:50 dilution and FITC-labeled donkey anti-rabbit IgG(green). 1X10^6 HeLa cells were stained with 0.2ug HDAC1 antibody (10197-1-AP, red) and control antibody (blue). Fixed with 90% MeOH blocked with 3% BSA (30 min). Alexa Fluor 488-conjugated AffiniPure Goat Anti-Rabbit IgG(H+L) with dilution 1:1000. Histone deacetylases(HDAC) are a class of enzymes that remove the acetyl groups from the lysine residues leading to the formation of a condensed and transcriptionally silenced chromatin. The protein encoded by this gene belongs to the histone deacetylase/acuc/apha family and is a component of the histone deacetylase complex, which is responsible for gene expression silencing. It also plays an important role in the control of cell proliferation and differentiation by interacting with RB, p53 and other transcription factors. At least 4 classes of HDAC were identified. As a class I HDAC, HDAC 1 was primarily found in the nucleus. 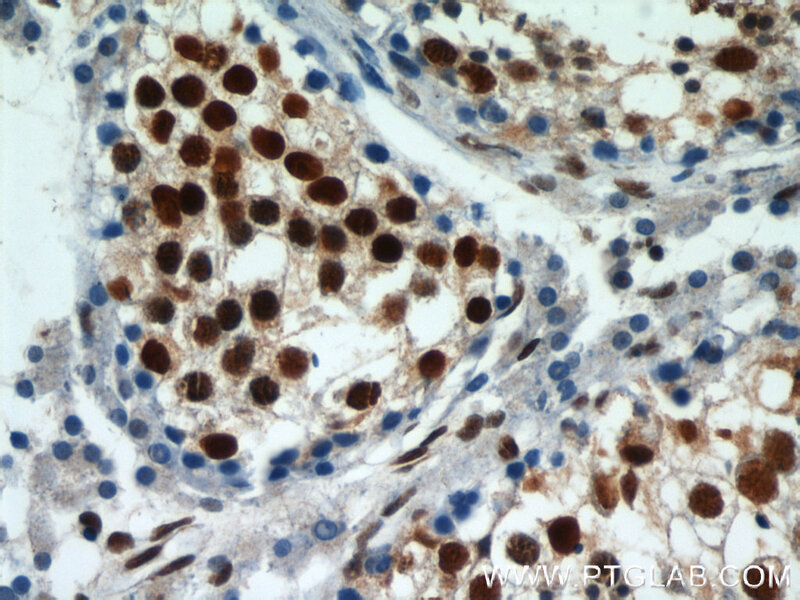 This antibody is a rabbit polyclonal antibody raised against residues near the C terminus of human HDAC1. The calcualted molecular weight of HDAC1 is 55 kDa, but modified HDAC1 is about 60-65 kDa . Effect of Histone Deacetylase Inhibition on the Expression of Multidrug Resistance-associated Protein 2 in a Human Placental Trophoblast Cell Line. ABIN1 inhibits HDAC1 ubiquitination and protects HDAC1 from both proteasome- and lysozyme-dependent degradation. Histone deacetylase-1 as a prognostic factor and mediator of gastric cancer progression by enhancing glycolysis. Differential HDAC1/2 network analysis reveals a role for prefoldin/CCT in HDAC1/2 complex assembly. Toxoplasma Effector TgIST Targets Host IDO1 to Antagonize the IFN-γ-Induced Anti-parasitic Response in Human Cells. 1X10^6 SH-SY5Y cells were stained with 0.2ug HDAC1 antibody (10197-1-AP, red) and control antibody (blue). Fixed with 90% MeOH blocked with 3% BSA (30 min). Alexa Fluor 488-conjugated AffiniPure Goat Anti-Rabbit IgG(H+L) with dilution 1:100.